Queen began 2014 on an ominous note, with guitarist Brian May revealing a visit to doctor over various pains resulted in the need for further tests – including those for cancer. February brought news that Queen’s 198l “Greatest Hits” collection had become the first album to sell more than 6 million copies in the UK, meaning that one in four British households owned a copy of the country’s best-selling album of all time. In March, Queen announced a summer tour of North America with Adam Lambert, with shows to begin June 19 in Chicago. The same month brought headlines that the band’s musical, “We Will Rock You”, would close in London on May 31 after a 12-year run and 4600 performances. Queen issued an update on the forthcoming film about their late singer, Freddie Mercury, with news that filming would begin in May with actor Ben Whishaw (Skyfall, Cloud Atlas, Stoned, I’m Not There) in the leading role. A late summer tour of Australia for Queen + Adam Lambert was announced in May, marking the band’s first tour of Australia since 1985. 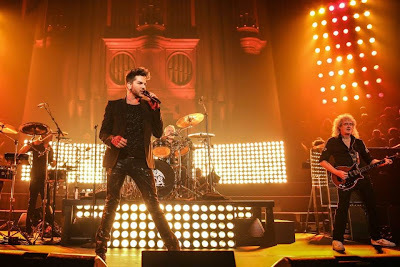 Queen + Adam Lambert launched their North American tour in Chicago on June 19; fan-shot video surfaced – landing it as the No. 9 Rock News Story of The Year. In June, the group announced a fall release for “Live At The Rainbow ‘74”, featuring Queen captured in concert over three legendary shows at the famed London venue. Queen premiered the new Freddie Mercury duet with Michael Jackson, “There Must Be More to Life Than This”, in mid-September as a preview to the “Forever” album release. Drummer Roger Taylor received an honorary Doctor Of Music degree from UK’s Plymouth University on September 26. A few days later, the group announced European tour dates for a run to start in January 2015. Queen + Adam Lambert performed the band’s 1976 classic, "Somebody To Love", on The X Factor UK on November 30. The band closed out 2014 and rang in the New Year with an intimate concert in London, broadcast live on the BBC and streamed online for fans around the world. Queen + Adam Lambert will launch a European tour in Newcastle, UK on January 13; the 6-week run wraps up late next month with three UK arena dates.